Tiny soil microbes are among the world's biggest potential amplifiers of human-caused climate change, but whether microbial communities are mere slaves to their environment or influential actors in their own right is an open question. Now, research by an international team of scientists from the U.S., Sweden and Australia, led by University of Arizona scientists, shows that a single species of microbe, discovered only very recently, is an unexpected key player in climate change. The findings, published in the journal Nature, should help scientists improve their simulations of future climate by replacing assumptions about the different greenhouse gases emitted from thawing permafrost with new understanding of how different communities of microbes control the release of these gases. Earlier this year, the international team discovered that a single species of microbe, previously undescribed by science, was prominent in permafrost soils in northern Sweden that have begun to thaw under the effect of globally rising temperatures. 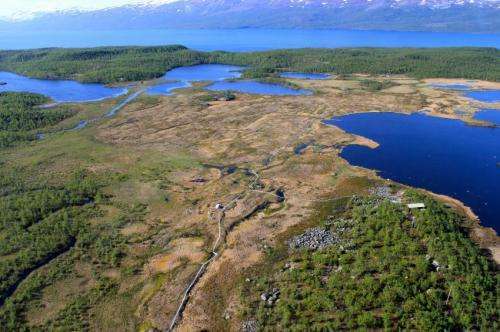 Researchers suspected that it played a significant role in global warming by liberating vast amounts of carbon stored in permafrost soil close to the Arctic Circle in the form of methane, a powerful greenhouse gas trapping heat in the Earth's atmosphere. But the actual role of this microbe—assigned the preliminary name Methanoflorens stordalenmirensis, which roughly translates to "methane-bloomer from the Stordalen Mire"—was unknown. The new research nails down the role of the new microbe, finding that the sheer abundance of Methanoflorens, as compared to other microbial species in thawing permafrost, should help to predict their collective impact on future climate change. "If you think of the African savanna as an analogy, you could say that both lions and elephants produce carbon dioxide, but they eat different things," said senior author Scott Saleska, an associate professor in the UA's Department of Ecology and Evolutionary Biology and director of the UA's new Ecosystem Genomics Institute. "In Methanoflorens, we discovered the microbial equivalent of an elephant, an organism that plays an enormously important role in what happens to the whole ecosystem." Significantly, the study revealed that because of these microbial activities, all wetlands are not the same when it comes to methane release. "The models assume a certain ratio between different forms, or isotopes, of the carbon in the methane molecules, and the actual recorded ratio turns out to be different," said lead author Carmody McCalley, a scientist at the Earth Systems Research Center at the University of New Hampshire who conducted the study while she was a postdoctoral researcher at UA. "This has been a major shortcoming of current climate models. Because they assume the wrong isotope ratio coming out of the wetlands, the models overestimate carbon released by biological processes and underestimate carbon released by human activities such as fossil-fuel burning." Soil microbes can make methane two different ways: either from acetate, an organic molecule that comes from plants, or from carbon dioxide and hydrogen. "Both processes produce energy for the microbe, and the microbe breathes out methane like we breathe out carbon dioxide," McCalley said. "But we find that in thawing permafrost, most methane initially doesn't come from acetate as previously assumed, but the other pathway. This ratio then shifts towards previous estimates as the frozen soils are turned into wetlands and acetate becomes the preferred carbon source." One of the big questions facing climate scientists, according to Saleska, is how much of the carbon stored in soils is released into the atmosphere by microbial activity. "As the 'global freezer' of permafrost is failing under the influence of warming, we need to better understand how soil microbes release carbon on a larger, ecosystem-wide level and what is going to happen with it," he said. Said UA co-author Virginia Rich: "For years, there's been a debate about whether microbial ecology 'matters' to what an ecosystem collectively does—in this case, releasing greenhouse gases of different forms—or whether microbes are just slaves to the system's physics and chemistry. This work shows that microbial ecology matters to a great degree, and that we need to pay more attention to the types of microbes living in those thawing ecosystems." Added McCalley: "By taking microbial ecology into account, we can accurately set up climate models to identify how much methane comes from thawing permafrost versus other sources such as fossil-fuel burning." .....and when the Arctic melted, the BLOB thawed and immediately began moving south. Unfortunately, Steve McQueen was no longer available to stop it.......WHAA HAHAHAAH! We're still waiting to see what happens with the clathrates. This is a different methane source. Typical denier obfuscation by confounding two things that are different and pretending they're the same. Well this is a short term effect until these microbes are done feasting and the soils normalize. Hopefully they won't do too much damage until then. @Tegri, thanks for the wiki. @Shootist, your link, for once seems credible. ""Efforts to prove the theory that carbon dioxide is a significant greenhouse gas and pollutant causing significant warming or weather effects have failed. "There has been no warming over 18 years." As an AGW-er, I couldn't agree more. The first statement, absolutely, I agree, the second of course; there should only be a weak correlation, such as from temperature being a secondary effect. Difficult to separate wheat from chaff type data. Of course, no one can deny the ice caps and glaciers have melted. So now it seems CO2 is discounted, right along with the availability of personal home CO2 meters. So now they just need to disprove my little theory, tough to do, considering a major prediction was global melting. Since it occurred, they're behind the eight ball. But i have confidence that they'll come up with something to keep the debate going. They'll have help from those GW-ers who still believe in CO2. So CO₂ doesn't have an absorption spectrum? Or some third weird crackpot physics crankism I'm not inventive enough to come up with? So, it is going to amplify a signal of zero. Good thing the world is cooling off then..! According to your cherry-picked sources. Anyone who dismisses the joint findings of the US National Academy of Sciences AND the British Royal Society is a crank. "Data from 2007 suggested methane concentrations were beginning to rise again. This was confirmed in 2010 when a study showed methane levels were on the rise for the 3 years 2007 to 2009. After a decade of near-zero growth in methane levels, "globally averaged atmospheric methane increased by [approximately] 7 nmol/mol per year during 2007 and 2008. During the first half of 2009, globally averaged atmospheric CH4 was [approximately] 7 nmol/mol greater than it was in 2008, suggesting that the increase will continue in 2009."" Please do tell me where I said anything about CO2. Trouble reading, sport? I was responding (note the quote) to someone else, in the second half of my post, denoted by the +++++++++++++ between the two quotes and responses. It's still a straw man attack to claim that I said that methane from the two sources is "different methane," when what I really said was that the mechanisms that cause the methane to be released are different; one is bacterial growth, the other is warming of the ocean (which in fact is taking place, and will in fact eventually destabilize the clathrates). Nice try, though. One star for obfuscating. So a suggestion is conclusive evidence now? How about you quit reaching and show us some actual evidence. Except you ignored that methane has been decreasing and one source of methane is no different than another. And you obviously use logical fallacies in your arguments. That's not very smart. Can anyone indicate a source that shows that methane has been decreasing? TegeriNenashi showed a link (http://en.wikiped..._methane ) that clearly shows that atmospheric methane is continuing to rise. Other sources also show methane levels increasing (i.e., http://www.epa.go...ons.html ). It seems a strange myth to have made up, so I'm wondering if there's an obscure source for this claim. Well, I just did (as well as NOAA and EPA) ;). Maybe I'm missing the point of the argument? Apologies for messing up TegiriNenashi's name. There was a plateau before 2007, so everything past this year sure looks like "acceleration". Atmospheric methane (CH4) increased through much of the twentieth century, but this trend gradually weakened until a stable state was temporarily reached around the turn of the millennium, after which levels increased once more. The deniers of course latched onto this and have been trumpeting it ever since, despite the fact it started increasing again. My comment did, as you pointed out, encourage this denial. Thanks for pointing it out. Sorry, but arctic methane is seen nowhere on the pie chart. The modest increase that we witness is perfectly explained by the rise in the two major components: oil&gas production and farming. Methane bomb has been defused. Ummm, the clathrates are still sitting there on the continental shelves, Tegiri. And it's still getting warmer. "Tiny soil microbes are among the world's biggest potential amplifiers of human-caused climate change"
'amplifiers of human caused change'. so now, mother nature is making man made climate change worse. this is not about science folks. this is language programming. this is brainwashing.